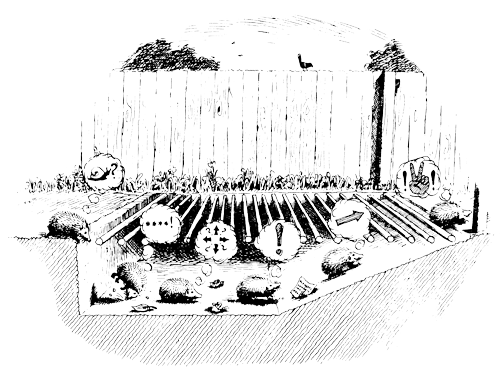 If a hedgehog, or other small mammal or bird falls into the pit beneath a cattle or sheep-grid, the near-vertical walls beneath the grid are too steep for the animal to climb out. The result could be a horrible and long-drawn out death by dehydration and/or starvation. The escape ramp for hedgehogs and other small animals is nothing elaborate. It is simply a slope of about 20o in one corner of the pit (preferably an “outer” corner i.e. a corner to which the cattle/sheep do not have access). It can be made of concrete, say 8” wide, or of wood or metal. The surface should be allowed to remain rough to enable the escapee to gain a foothold. If it is impossible for an animal to gain access to the whole of the pit i.e. if it is sectionalised, more than one “ramp” would be required. Similarly in a very large cattle/sheep grid, two ramps would be preferable. British Standard 4008:1973 contains useful information on Cattle Grids. Also, FRCA (formerly ADAS) can provide full details on the design and construction of cattle grids, including specifications for escape ramps. Please publicise the installation of these escape ramps, as this will assist the acceptance of such schemes nationwide. Their cost, of course, is negligible. Do contact us if any further information is required.